Thought is the most mysterious phenomena. It exists as the middle principle between existence and Creation. It is true with us too!Let us see how thought happens. We exist. We exist as energy systems. A thought emerges from us. The energy (in us or as us) follows the thought. Together they move the system i.e., the cerebra nervous system, the senses, the limbs etc., If there is no thought, we remain static, stable, immutable units of existence. Thought moves and also mutilates our state of pure existence. Just like a still water lake is filled with ripples of water, when disturbed, the static, stable or poised system is moved, mutated and even mutilated by the thought. It is interesting to note, how thoughts keep coming (emerging). We have no thoughts when we are in deep sleep. In sleep, the stability is regained because there is no thought to move us. We remain as pulsating units without thinking. Hence sleep restores to us our energy. It refreshes us. In sleep we exist but we do not carry awareness. Awareness comes as we wake up. In sleep, awareness merges in existence. As we awake, awareness springs up from existence. In fact, our waking up is nothing but the springing up of our awareness from existence. That means we have already got mutated from existence to awareness. We are thus moved from the static state to dynamic state. Existence is the basis for our awakening. Awakened state is the basis for our thoughts. As we wake up the thinking process is switched on. Remember that (a) we are awakened and we do not awake (b) we receive thoughts and we do not think. Many people are of the view that they think. If they conduct thinking, they should be able to stop thinking when they do not need to think. But unfortunately, the thoughts keep haunting even when there is no need of them. We are not masters of our thinking process. Thoughts keep happening inspite of us. Only a Yogi who gains mastery over mind can, at will switch on and switch off the thinking process. Thoughts keep occurring as we are awakened. Each person gets thoughts on the basis of his own placement in life. Life situations are the motivating factors for the variety of thoughts we get. A country's President's thoughts and the thoughts of an up-country man differ vastly from each other because of their placement in life. Even within the house the early morning thoughts of the members of the house differ from each other substantially. The thoughts of the head of the house are different from those of the lady of the house. The thoughts of the children are different from those of the parents. And even among the children, the thought of each child differs from that of the other. Again, there are grandparents in the house, whose thoughts are at variance with others- See! How wonderful is the Creation. Even within a house, though the family members are apparently together, they are far from each other in their thought-world. Each has his own thought-world. He lives and moves in his world. Occasionally when thoughts coincide, they live together momentarily. Where thoughts meet, there people meet. This is the main factor that decides the togetherness of family members in due course of time. It is also true with groups, with friends and associations. A group of persons remain together for long years when they are bound by the same thought. When thoughts differ, the members of the group leave, only to find expression in another group, where there is agreeability of thoughts. A friendship is a situation where the thoughts meet in a deeper sense- It does not mean that all the thoughts between two friends are identical. But there are some thoughts that bind them together deep in their being. Even when other thoughts differ, the few deeply binding thoughts keep them together. In areas where they differ in thoughts, they agree to adjust and adapt. The deeper thoughts that bind two persons together are called the thoughts of LOVE or belonging to each other. In life, we meet a variety of people at different stages. In childhood we have some associations, in youth some other associations, in the middle age yet another grouping, in the old age still another grouping. The grouping in life is verily according to the agreeability of thoughts. A gambler instinctively meets another gambler. A businessman meets another. All drunkards meet in the bar. Officials group themselves. Politicians likewise group up. Revolutionaries similarly group up. Thieves group up. Smugglers group up. Card players group up. Religionists group up. Each religious group is bound by the thoughts of their preceptor. Hence as many religions as the religious heads. Isms and cults are thus formed in every walk of life and thought is solely responsible for all their grouping. We do not suffer from congestion and its suffocation when we are more accommodative in our thoughts. The narrower the thought the worse is the suffocation. Learn therefore to see brothers, and not others. The more and more we widen the horizon of our thought, the more and more we feel the freedom of existence. The other way is only the way to imprisonment. High Souls like Krishna, Buddha, Christ and a host of Masters of Wisdom continuously demonstrate the thought of inclusion as against exclusion. They did not exclude any one. But the people excluded and thereby secluded themselves from such High Souls. We can therefore, easily understand that we can be broad minded or narrow minded according to the pattern of thoughts we entertain. Happy are those who entertain thoughts of tolerance, patience, compassion, love, charity, inclusion and the like. Such positive thoughts energise those who entertain them. They are source of health. Thoughts of jealousy, fear, suspicion, anxiety, doubt and the like pull down the energy system and contribute to chronic ill-health. An exercise to transform the thought form is worth attempting and attaining. Observe daily for 15 minutes in the morning as we plunge into daily routine the kind of thoughts we are filled with. Likewise, observe the thoughts we are filled with in the evening, at the end of the activity. Also, recollect what kind of thoughts have been entertained during the day. A diary shall have to be kept to make note and to resolve for entertaining better thoughts. Thoughts are basis for speeches and actions. Any malice in thought finds its expression automatically in our speeches and actions. Having spit out such speeches and actions, we cannot retrace. We cannot pull back. It creates consequences. A thought of malice shall have to be neutralised at any cost. If we carefully observe, a malicious thought somehow finds its way out through speech and action however much we resist. Unless it is released (or alternatively neutralised) it haunts till it is expressed. It is like the snake trying to find its way out. In life we come across many situations where we bite our tongue having said something distasteful, or do something which we later find to be hasty. Flippant speeches and actions are common in the life of the ordinary. How to over come this situation? The first step is recognition of our state vis a vis the thought. Second step is to understand that thoughts emerge out of our nature, inspite of us. Third step is to analyse the kind of thoughts for which our mind remains the playground. Fourth step is to observe the trend daily in the morning and evening of the emerging thoughts. The fourth step needs to be practised for long years. As we keep observing our thoughts, in due course of time, we stand out of our thoughts as observer. The moment you become independent, you are separated from the thought forms and you stand out as observer. You feel the relief. Imagine a person being swept away by the current of the river flow for a long time. Slowly he finds the hold to overcome the sweep and reaches the river bank. The relief he feels is imaginable. So is the relief of a man who overcomes the sweep of thoughts that propelled him like a slave over years. Practise to observe your thoughts. Even as you are swept away by the current of thoughts, bring back your proposal to observe. So long as you observe, the thoughts and their flow is arrested. As you are dragged away by a thought, you forget observing and you go further with it. Slowly you recollect that you are to observe. As the recollection comes the thought gets arrested. You once again remain an observer. In this practice, we remain the observer. In fact more often we cease to be an observer in the beginning. We get easily swept away by the thoughts, just as hay is swept away by the wind. It seems impossible to observe. It is not so. It is a matter of continuity. When anything is practised continuously, the impossible gives way. The impermeable becomes permeable. To walk on a rope seems impossible. But how are some doing it? It is a matter of practice and continuity in practice. Hence this step is crucial to mould ourselves. It needs to be practised if we wish to transform and overcome our limitations. (a) Reading of Scriptures for 15 minutes to 30 minutes a day. Scriptures of the world have withstood the vicissitudes of time. They carry eternal Truths, which do not change according to time and place. They contain right instructions of practice. Through study of scriptures the mind is filled for a while with right thoughts that substitute the thoughts relating to indiviual behavioural nature. The study gives a good cut off to the behavioural flow of thoughts. The Bhagavad Gita, the Bible, The Quoran or the teachings of Buddha, when studied regularly for 15 minutes – gives right orientation of thoughts. 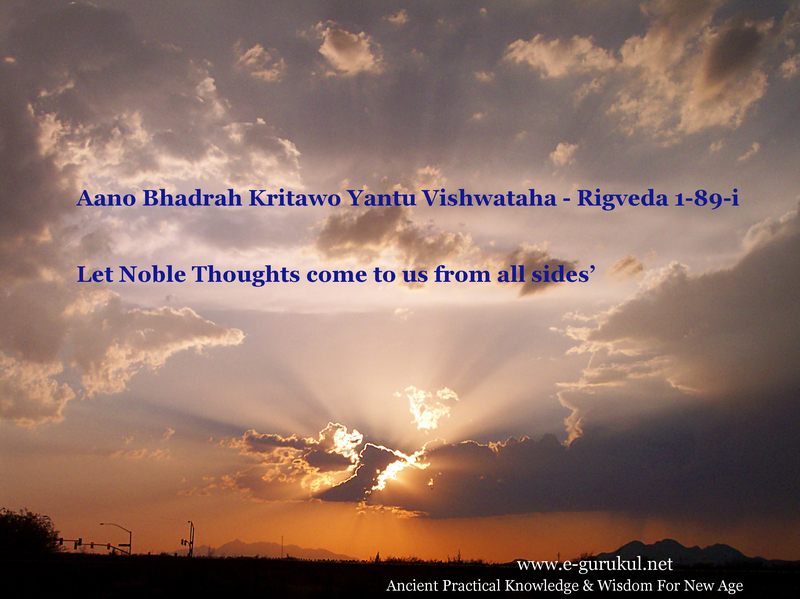 Hence this acts as an excellent complement to our practice to mould our thought patterns. (b) Study of the biographies of the World Teachers like, Rama, Krishna, Buddha, Christ, Saibaba, Ramakrishna Paramahamsa, Ramana Maharshi etc., also help elevating our thoughts into realms of Nobility, Generosity, Compassion, and Love. The study of the lives of Masters of Wisdom too, inspire us and thereby alter our thought patterns. Every Master of Wisdom is "Light made manifest" or "The word made flesh and blood". Study of their lives, their actions and their teachings have profound effect in transforming us. A process of magnetisation happens as we engage and engross in their thought. It is an effortless way to get transformed. When an iron piece is around a magnet there is little that the former needs to do. Its proximity to the magnet automatically begins the process of magnetisation. This is an ancient most and by far the most popular oriental method. Many iron pieces turned into magnets in the East, just by being around the magnets for long years. Uncomplaining service to a Master of Wisdom, without doubt and suspicion enabled many to shed their shackles and fly high. This is the eastern clue to all self transformation. Self magnetisation is a process that works but slowly. Presence of the magnet helps magnetisation faster. But it all depends whether one is around a magnet or a fake. This word of caution makes many follow the former method in recent years. (c) Recitation of Hymns for 15 to 30 minutes also helps the practice. Sound has a powerful impact on thought. Hymns are formulae conceived by the ancients to mutate, mould and build the harmonious thought patterns. There is scientific arrangement of sounds in Hymns and their right utterance have magical results, upon the utterer. Mantras too have similar impact when done under guidance. (d) Imagination of noble colours in the forehead too has a washing effect on thoughts. Observe the colours of the day time, sun-rise and sun-set times. You find crystal clear indigo, blue, light blue, violet, orange, golden yellow colours, which have a soothening effect upon your mind. The Moon light too has such an effect. Observe these colours in your life. Seldom do people look at the sky during the day as they are busy looking at earthy forms. It is a great relief when we see the sky, the sea, the mountain peaks, the flowing rivers, the water falls, the breeze, the fields, the flowers and so on. Above all the unbound sky instantly gives expansion of Consciousness which is circumscribed by self imposed thoughts and reduced almost to a point. Look at the clear sky – observe the colours of sky, imagine a colour of your choice filling your forehead. This is a colour-wash that helps in sweeping away the existing thoughts. Lighting a lamp and looking at the light is also part of this colour practice, which is now world wide. (e) Imagination of perfect forms and symbols and contemplating upon them is yet another method of moulding thoughts. The globe, the cube, the pyramid are such symbols which reorganise our energy patterns. The Dodecahedron too is one such symbol. Contemplation upon circle with a central point, the crescent moon, the triangle, the double triangle, the triangle in the square are also age-old symbols that systematise the one who contemplates upon them. In the East many more symbols are conceived. The science of symbols in the East is so advanced that they have a symbol for every specific purpose. The host of deities that are conceived are symbols upon which specific sounds are applied at specific times, to attain the purposes. This is part of the magic conceived in accordance with the Seventh Ray. Its application decides whether such magic is white or black. (f) Master D.K. suggests withdrawal of Consciousness to the mental plane and sounding forth gently the sacred word 3 times. Utter 'OM' three times gently sending forth breath as "clarifying and expurgating" force. In its onward, progress it sweeps away the thought forms circulating within the mental Ovoid. The fire of intellect is now seen to burn significantly among civilised people – says Master D.K. All energies are now turned to feed the spark of mind to turn it to the greatest profit. Our thoughts in so far as they are well directed build up and focus themselves to the benefit of all concerned. If left unregulated, they burn up the individual who entertains these thoughts. Only the man who has worked out these regulations has the capacity to project a thought. Feel it, focus it and manifest it through sustained effort. The power of thought is vast and is the basis of creation – individual or universal. Blessed are those who monitor the thoughts and live life like (uncrowned though)Kings. Pitiable are those who are enslaved by their own thought forms. Let this power of human beings be realised even in the early stages of life, before one encircles oneself in the meshy thoughts of one's own.